If your travels and adventures make the use of a VPN sound like a good idea, Stacksocial is now offering a 2-Year Subscription of NordVPN for $69 total, averaging to $34.50 per year. You can connect up to six devices to the VPN simultaneously. They support Windows, Mac, Linux, ChromeOS, iOS, Android and routers (with DD-WRT capabilities). You can purchase multiple licenses, but you cannot stack the 2-year subscriptions. On the cloud storage front, they are offering a 1-Year Subscription of pCloud Premium Plus Cloud Storage, a Switzerland based company for $30. This includes 2TB of cloud storage, unlimited uploads, and 2TB of downloads. They have a 30-day trash history as well in case of accidental deletions. It supports Windows, Mac, Linux, iOS, Android and Windows 10 Mobile. The offer is good for new or free pCloud users. One user account can access the cloud from multiple devices. Flash sales are all the rage these days. Stacksocial is offering a 1-Year 2TB SpiderOak ONE Cloud Storage subscription for $30. You can connect as many devices as you like and it supports Windows, Mac, Linux, iOS and Android. These clouds don’t make it rain 😉 Coupon code SAVEZOOLZ15 gets you 15% off the 2TB Zoolz Lifetime Cloud Storage Service dropping it from $50 to $42.50. The previously mentioned Stacksocial coupons can get you the 2TB Zoolz Lifetime Cloud Storage Service for $30. The price on the page is $50, dropping to $30 with 40% off coupon GREEN40. This is a one-time fee, not an annual fee. This service gets you 1TB of vault storage and 1TB of cold storage, with two users. On the same listing, there’s a 100GB option for the same price. The 100GB option is for “hot storage”, for example you can use it to stream movies you uploaded to the Zoolz cloud, it is more of a smartphone or tablet companion, and you only have one user. Check the Specs and License terms for their differences. You can test the coupon without logging on or creating an account. Add the items of interest to the shopping cart, and look for the “Promo Code” little link on the right side of the page, below the “Order Summary”. UPDATE: coupon still works as of 11/26/17 AM! Stacksocial is offering the 2TB Lifetime Zoolz Cloud Storage for $35. You only pay $35 once, and you have lifetime access to 2TB of cloud storage. This is divided into 1TB of Instant Vault and 1TB of Cold Storage. Offer cannot be combined or stacked with existing accounts for more storage. Then enter limited time 20% off coupon code BFRIDAY20 in the shopping cart, and the price drops to $28! The coupon applies to almost everything on their website, not just this cloud service! For a limited time, Stacksocial is offering the 2TB Lifetime Zoolz Cloud Storage for $35. You only pay $35 once, and you have lifetime access to 2TB of cloud storage. This is divided into 1TB of Instant Vault and 1TB of Cold Storage. Offer cannot be combined or stacked with existing accounts for more storage. Dell Small Business is off to the Black Friday races with a cloud-busting deal. They are offering 1-Year Annual Dropbox PLUS subscription for $60 and with that you also receive a $25 promotional Dell e-Gift Card within 20 days after purchasing. Dropbox Plus gets you 1TB of storage for one year for one user. They support all the major platforms including Linux. I do not know if this offer can be appended to an existing Dropbox paid subscription. The $25 promo e-gift card can only be spent at Dell, and usually within 90 days upon receipt. That’s why it’s a promotional e-gift card instead of a regular gift card. PS: speaking of clouds, Stacksocial offers the 2TB Lifetime Zoolz Cloud Storage for $40 instead of its usual price of $50. The 2TB are broken into 1TB of Instant Storage and 1TB of Cold Storage. It includes access to two machines for backups. This is for new customers only and cannot be “stacked” for more space. This is a lifetime service, not an annual subscription! Cloud action now! Stacksocial has a new limited time doorbuster, they are offering the 2TB Lifetime Zoolz Cloud Storage for $40 instead of its usual price of $50. The 2TB are broken into 1TB of Instant Storage and 1TB of Cold Storage. It includes access to two machines for backups. This is for new customers only and cannot be “stacked” for more space. This is a lifetime service, not an annual subscription! To the Clouds we fly thanks to the Dell Home Deals, for a limited time, you can purchase a 1-Year Dropbox Plus subscription for $69. This gives you 1TB of storage for one user. It supports all the major desktop and mobile OSes. If you are looking for an additional storage and backup option to integrate into your strategy, for a limited time, Stacksocial is offering 2TB of Zoolz Cloud Storage for $50. This is a lifetime service. You pay $50 once and you continue to use the service without any additional fees. This includes 1TB of instant Vault storage, and 1TB of cold storage. This runs on the Amazon AWS. You can use two different computers to make backups. This offer is for new customers only, it cannot be stacked with additional promotions like this to get more storage at the same price. If you are a fan of The Dropbox, there is a new promotion for it at Dell Small Business. A 1-Year Dropbox PLUS subscription goes for $60. You also get a $25 Dell promotional electronic gift card. This will be emailed to you 10-20 days after your purchase. The promotion is mentioned on the aforelinked product page, and appears automatically in the shopping cart while this promotion is running. No coupon code needed. Dropbox Plus is a 1-year 1TB storage subscription for one user. This subscription level has a 30-day Version History and File Recovery. The 2TB+ plans increase this to 120 days, and offer multiple users per account. Once purchased, you will receive an email within 4-8 hours on the Dropbox Plus subscription. PS: the product description over there does not say, and I do not know, whether this is for new PLUS subscribers only or it can be appended to existing PLUS subscriptions. PLUS is the next step after the free Dropbox tier. If you are a fan of cloud storage, Stacksocial has a 1TB Zoolz Cloud Storage sale with lifetime access for $30 as a one time payment fee. This is two products, you get 500GB of instant storage, and 500Gb of cold storage (takes 3-5 hours to retrieve the backups). You can install the Zoolz backup app on two devices, but you can restore your backups from additional devices. You can change the designated backup devices, but you can only have two active ones at a time. Check terms and description for all the details. Speaking of Stacksocial, they have a variety of Pay What You Want promotions including one for photography. Minimum price is $1, but if you want to unlock additional items, you have to meet or beat the average price, which typically is under $20. And now we are back to the daily routine, and we start …cloudy. Dell Home is offering a 1TB 1-User Dropbox Pro Annual Subscription along with a bonus $15 Dell Promotional eGift Card (automatically added to the shopping cart while this promotion is running) for $70. Both offers are digital, so no shipping fees. Offer ends by 7/21/16 at 7am central time. Cloud action now, Dell Home is offering a 1-Year 1TB Dropbox PRO subscription for $90 plus a $15 promotional Dell eGift Card. The promo eGift Card appears in the shopping cart and has a 90-day life span after it is emailed to you (10-20 days after your order ships). Speaking of Dell and promo gift cards, you can get the 22 inch Dell S2216H Monitor along with a $75 Dell promo eGift card for $170 with free shipping. Use coupon code MONITOR30 to drop the price from $200 to $170. 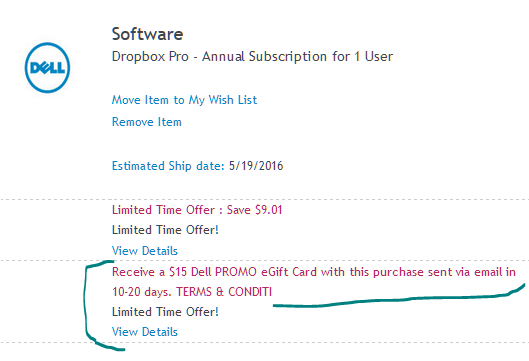 Both offers end 5/23/2016 6:59am Dell time (or earlier if sold out). If you are looking for more cloud backup options, another Stacksocial promotion gets you a 2TB SkyHub Cloud Backup Lifetime Subscription for $40. This covers up to four computers and back up for NAS & DAS drives. This is an all sales final promotion. Check the listing over there for all the details. I haven’t used this service, so I can’t say what to expect when you sign up for the first time. Limit five subscriptions per customer per the shopping cart there. Amazon is offering (for a limited time) a FREE 12-month Amazon Cloud Unlimited Everything Cloud Storage subscription when you make an eligible purchase, including camera gear purchases of $50. Details and eligible items through the Cloud Promotion page. This service level is Everything, not just Photos (which is included with a Prime membership). This promotion is good for everyone, both Prime members and non-Prime member. If you need more than photo storage, they also have a limited time promotion, 1yr of Amazon Cloud Drive Unlimited Storage (not just Photo) for $5 for the first year. The regular price is $59 per year. Prime members get free unlimited photo storage, but not unlimited everything storage. So if you are a Prime member and mostly need photo storage space, you don’t need this service. On the other hand, if you also need lots of storage space (more than 5GB) for documents, videos, music files (not purchased from Amazon), and other non-photo files, then this might be of interest. PS: mp3 music files purchased directly from Amazon, or added to your Amazon account because of an AutoRip eligible purchase (CD or Vinyl) do not count towards your storage limits. If you are not an Amazon Prime member, this promotion is for you. For a limited time you can sign up for 1-Year of Amazon Cloud Drive Unlimited Photo Storage for $1. The $1 price is for the first year. The regular price is $12/year. You also get 5GB to use for other non-photo files. If you are a Prime member, you already get FREE unlimited cloud photo storage. If you are a Prime member and visit the above website logged to your Prime account, you will not see the offer because you already get this service for free. For the speed-readers, this offer is for the Unlimited Cloud Photo Storage service. This is different from the Unlimited Cloud Storage (not just unlimited photos). Amazon is very big on cloud (side-effects of living in Seattle? ), and now they have yet another unlimited cloud storage promotion. This one is not limited to Prime members or Fire Phone users. During this promotion, you get One Year Unlimited Amazon Cloud storage if you purchase camera gear individually priced $50 or more. This is The List of Eligible Items, a total of 33,403 items are eligible. They must be sold and shipped by Amazon itself (not by marketplace sellers). The offer is one per customer, so you cannot stack cloud-years. You can find the Terms And Conditions below the giant thumbnails over there. The expiration date is not mentioned. After the one year ends (12 months), the subscription fee for this is $60/year. You can cancel it later if you don’t want to continue with it once the free year expires. How to Check If Your Item Of Interest is Eligible? If you need a 1TB lightweight external hard drive and could use some boost to your OneDrive cloud storage, the 1TB Seagate Backup Plus Slim Portable External Hard Drive (USB 3.0, model STDR1000102) is on sale for $55 with free shipping in the blue and red color schemes at Amazon by Amazon itself with a limit of five per color. The silver and black go for slightly more. The different colors can be useful if you want to easily color-code them for your mobile or internal backup purposes. Once you register these, you can receive 200GB of OneDrive cloud storage for two years. This is good for new or existing OneDrive accounts but you can only redeem one of these 200GB freebies per OneDrive account. TIP: here is one color coding scheme: red for weddings, blue for landscape, black for family, silver for business. If you are fond of cloud backups, among the offers at Stacksocial you can get a 1TB Lifetime subscription cloud backup plan for $55 by Dripbit. You only pay once and you get 1TB of cloud storage for life. Optionally you can add more storage later if you want to. Supports up to five devices at a time and works with Windows, Mac, iOS and Android. This is instant redemption. All sales final. During today’s Google I/O 2015 (see video), Google revealed a stand-alone Google Photos app that will be available on Android, iOS and the Web. It will sync with Google Drive, and has a number of features including free unlimited backups for images up to 16 megapixels and videos up to 1080p. Not sure yet what happens for images over 16mp. If you have a Samsung Galaxy smartphone or tablet, one of the Samsung Owners Hub offers is ten free presets for the VSCO Cam photo app. I don’t know if every Samsung (Galaxy) device is eligible or some of them or if this depends on registration status and such. Samsung works in mysterious ways 🙂 The offer is available through the Samsung+ app on Google Play which is the new name for the Samsung Owner’s Hub. Once you install that app, go to the Promotions tab, and page down until you see the VSCO Cam offer. There is a little link thing to press in a circle on the left side (see screenshot below) to get you to VSCO Cam. There’s also an offer that gets you two years of an extra 100TB of Microsoft OneDrive cloud storage there. PS1: I don’t know if these offers are stackable with the Galaxy Perks. If you are a fan of cloud backups and backups-of-backups and backups-of-backups-of-backups (and so forth), Amazon is now selling Unlimited Photo storage for $12 per year for non-Prime members. Prime members get this feature for FREE as part of their Prime membership. If you are not a Prime member, you get a free 3-month trial of this service. It includes unlimited photo storage plus 5GB of any other file types (videos, documents, etc, your choice). If you want to store a lot of other data (not just photos), they have a $60/year Unlimited Cloud Storage plan. Everyone has to pay for this plan, Prime members too. This plan too comes with a free 3-month trial membership. This is an automatic renewal subscription service, so it will keep renewing unless you manually cancel it on your Amazon account. It requires a credit card (no debit/gift-cards) for the payment plans. Clarification #1: this general Cloud Drive offer should not be confused with the Fire Phone promotion that gets you unlimited photo storage for photos taken with the Fire Phone (which is not linked to a Prime membership, but includes a 1yr Prime membership upon purchase). Clarification #2: Digital Music you purchase from Amazon (or is included with a CD/vinyl purchase) is stored in your Amazon locker but does not count against your 5GB Cloud Drive storage. The 5GB is for anything you upload on your own. If you are looking for another/additional option for protection of your mobile photography, Stacksocial has a lifetime backup promotion from iDrive. You pay $10 once, and you can make unlimited mobile device backups using the iDrive apps on Android, iOS and Windows Phone. You can connect up to five devices to this plan. This is good for new iDrive accounts only. This is a one-time $10 fee, not a monthly or annual fee. All sales are final. Check aforelinked page for terms/conditions. Offer ends in about 4 days from today. @mbateswa You can upload all 1.8 TB of photos as the benefit is unlimited photos, and we accept individual files of up to 2 GB. One thing to note is that the offer is only for photos, not videos. Another thing of note, if you are using uncommon file formats, their system may not recognize them as pictures and instead count them against the cloud quota. If so, contact their customer service and they should be able to fix it since they don’t have a restriction against RAW files philosophically. If you are an Amazon Prime member, or if you are on the bubble as to whether to sign up or renew the membership, Amazon just revealed another Prime member benefit. Unlimited photo storage with Amazon Cloud Drive Photos. They are multiple ways you can load up your Cloud Drive with photos: it has a Google Play Android app (Android 2.3.3 or later), an iTunes iOS app (iOS 7 or later), and Amazon Android-ish app store and Desktop PC apps (the pages for those try to automatically start a download so I’m not putting them here because that’s rude).